Piazza San Marco, often known in English as St Mark's Square), is the principal public square of Venice, Italy, where it is generally known just as la Piazza ("the Square"). 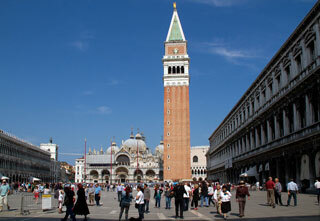 A remark usually attributed to Napoleon calls the Piazza San Marco "the drawing room of Europe". The Square is dominated at its eastern end by the great church of St Mark. It is described here by a perambulation starting from the west front of the church (facing the length of the Piazza) and proceeding to the right. This article uses material from the Wikipedia article "Piazza San Marco", which is released under the Creative Commons Attribution-Share-Alike 3.0 License.